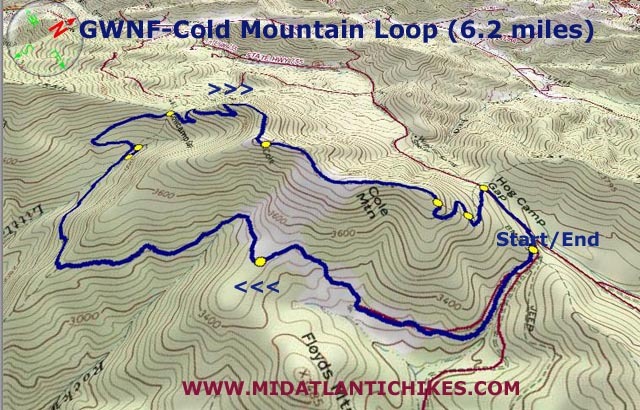 Description: This is a moderate 6.2 mile circuit featuring fantastic views from the balds of Cold (some maps call it Cole) Mountain. At the summit a nearly 360 degree panoramic view can be had. 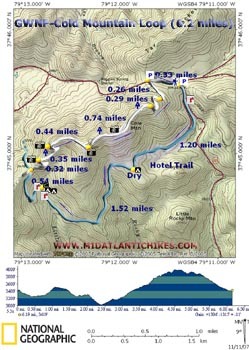 The total elevation gain is about 1100 feet. It is the sister hike of the Mount Pleasant Loop. 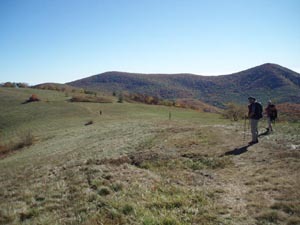 Although this hike can easily stand on its own we recommend combining the two for a more challenging 12 mile day hike or perhaps a nice backpacking trip. Note: Camping or fires are not allowed on the bald of Cold Mountain. The trailhead parking area is off of Wiggins Spring Road (FR 48) just beyond the AT parking area. Follow the signs for the Mount Pleasant Trailhead. Trail Notes: All trails are blazed and signed. There are three trailheads at the parking area. As you are looking at them you want the one furthest to the right. This is the Hotel Trail. It is obvious but not signed until you begin walking down it. In a short distance a spur trail will come in from the right and there will be a horse gate to the left. Pass through the gate and begin walking on a nice old woods road following the blue blazes. Initially you will be walking downhill or flat as you pass through a towering grove of pine trees. There will be a minor climb along the way before traversing a mini-bald to reach an excellent but dry campsite in 1.20 miles. 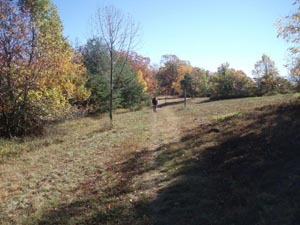 The trail continues as a footpath behind and to the right of the fire ring. 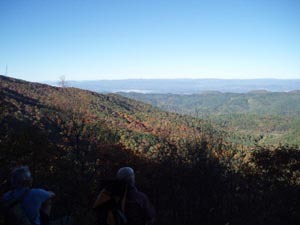 Eventually it joins another old woods road which you'll follow to the spur trail for the Cowcamp Gap shelter which is approximately 1.52 miles from the previous campsite. There is good water and camping here. 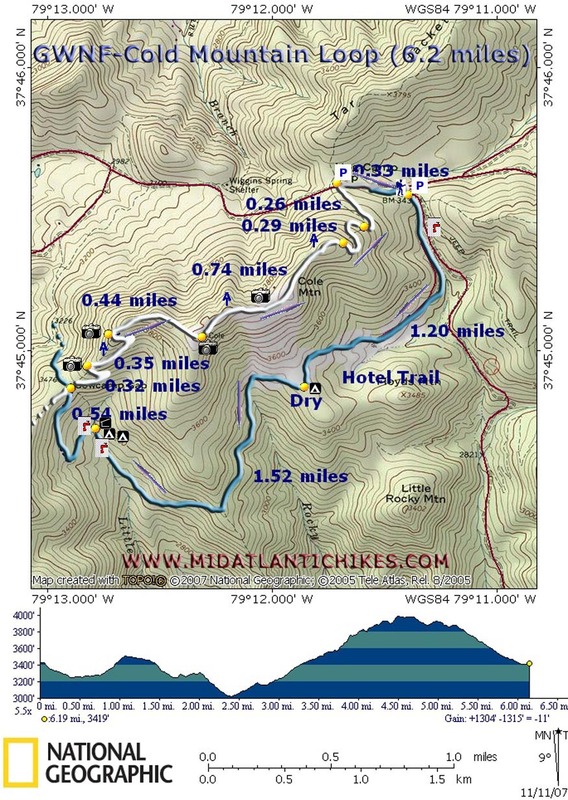 Continue to climb up the Hotel Trail for 0.52 miles to the junction of the AT. turn right and begin a gradual climb, via switchbacks, to the summit of Cold Mountain. The two western apexes of the switchbacks are accented with nice westerly vista. 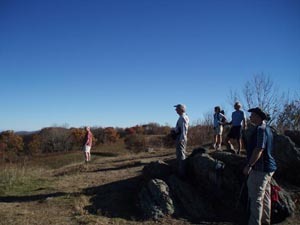 Keep a sharp eye out as you approach a rock outcrop near a false ridge. The blazes and trail seem to disappear suddenly. It continues through a narrow passage in the rocks and continues on the ridge. You'll know you're close to the summit as the grade increases and you look up asking yourself "Where are the trees?" Once at the top you'll be greeted by a 360 degree view. The best is at a pile of rocks which marks the official summit. From here the trail down through the bald is easy to follow. Most of it is an old road. 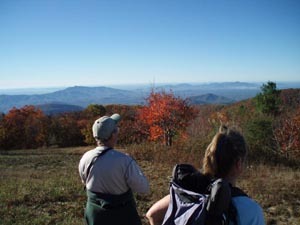 In 0.74 miles from the summit you'll leave the road to follow the AT on a footpath. It will cross the same road in another 0.29 miles. In 0.26 miles reach gravel Wiggins Spring Road. Turn right here and follow the signs back to your car. If you wish, about halfway down there is a blue blazed trail on the right that you can take to the horse gate near your starting point. Critique: This is a great hike. Not too hard not too easy. Great views. The only thing is the whole accessibility issue. The roads to get to the trail head are horrible especially if you have a low car. Must enter/exit from the west end of Wiggins Springs Road, else you will get stuck or on a dead end! !